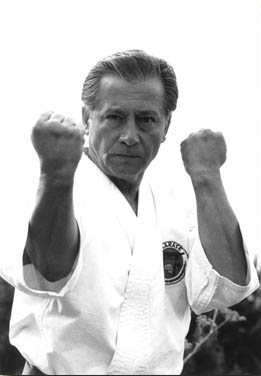 Hanshi Mohammad Ali Sharifi is an internationally recognized master in Shotokan Karate. He has taught for over 40 years and is highly respected as a coach, tournament judge and former competitor. He is the first Shotokan instructor in the United States to be awarded the rank of Seventh Dan by Master Hidetaka Nishiyama, head of the International Traditional Karate Federation (ITKF), and the American Amateur Karate Federation (AAKF). Hanshi was awarded Ninth Dan in 2016. Originally from Iran, Hanshi began his karate studies at the age of 19 in Baton Rouge, Louisiana under Sensei Mikami, former grand champion of Japan. He competed in the All South Karate Tournament in 1966 and 1967, a tournament which attracted many well-known martial artists and in which Hanshi defeated the top Tae Kwon Do competitor in a mixed competition. After studying and teaching with Mikami, Hanshi returned to Iran in 1971 and founded a vigorous Shotokan Karate organization which was recognized by Sensei Nakayama as a branch of the JKA in 1976. He and his students participated in many national and international tournaments and trained with high-ranking masters including Senseis Abe, Yahara, Nito, and Fukami. As head coach, Hanshi along with the other Iran-Karate Association Masters Mr. M. Nosratian, Mr. J. Jamsheed, and Mr. Mirbabai brought the Iranian National Team to the 1980 World Championships in Bremen, Germany, where they finished fifth out of 50 countries, defeating many much larger karate associations. When the war with Iraq started later that year, Hanshi and the Iran-Karate Association Masters were asked to give a 10-week self-defense course on hand-to-hand combat for Iranian national television. Since 1984, Hanshi has directed the Shotokan Karate Institute in Oakland, California. The dojo currently enrolls about 80 students, including men, women, and children, ages six to 85, of various races, creeds, backgrounds, and professions, from beginners to advanced black belts. Students from the dojo have attended a number of local and regional tournaments and have been very successful. Hanshi received his first and second dans from Sensei Mikami, his third from Sensei Abe, and his fourth, fifth, sixth, and seventh from Sensei Nishiyama. Sensei Nishiyama visited the Shotokan Karate Institute on a regular basis to give seminars and to participate in testing black belts. Hanshi participated for sixteen years in Sensei Nishiyama’s International Summer Camp Trainings in San Diego, California. A few of Hanshi’s outstanding students include Hassan Pakbaz, Fifth Dan, former collegiate champion of the United States; Majid Shamsahmar, Seventh Dan, named Outstanding Competitor at the European Championships in Frankfurt, in 1991; Mahmood and Hemat Tabbassi, Seventh and Fifth Dans, teaching in Washington D.C.; Reza Salmani, Seventh Dan, semi-finalist at the World Championships in Dubai (United Arab Emirates); Shaaolah Sepasi, Fourth Dan, European Champion for three consecutive years and Mr. Siamak Montazeri, Seventh Dan in Germany. Among fellow senseis, Hanshi is known as a healer who has found a close connection between spirituality and his karate training and teaching. Emphasis on spiritual and character development has always been an essential part of his teaching, and has helped his students develop courage and a positive attitude both in karate and in their daily lives.